Hello! I know it's Monday but can we talk about something "annoying" for a minute, please? She was on the bed. Instead of sleeping or resting, she was rolling from one point to another. And making some creepy sounds. She was getting me really scared. When I asked her what was wrong, she blurted "I feel miserable!" What makes a person feel miserable? Ladies would understand this thing. But for the cute guys who visit my blog, let's call it "sickness". Sickness can sure make a person feel miserable. Being sick can be a very difficult time. You might feel weak and useless unproductive. You might not feel like doing anything on a sick day. It's not easy to stay positive and inspired when you are sick but there are a few activities that can help you make the most of it. 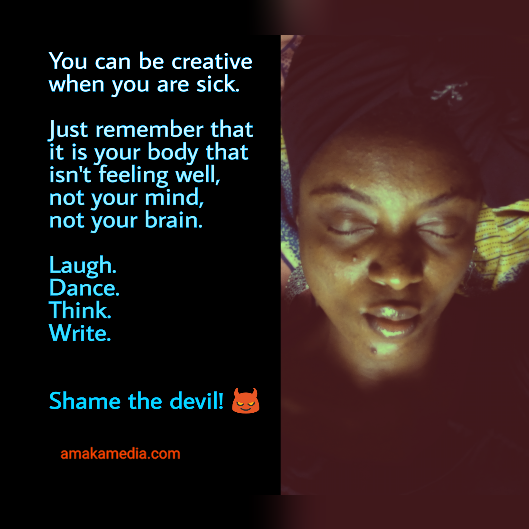 Remember it is your body that is sick, not your mind. Most times, we feel miserable when we are sick because we dwell in the pain and restlessness taking place in our body. If we can take charge of our mind and separate it from our body, something close to magic can happen. Let's learn to GET OUT OF OUR HEAD. Sickness can be a great opportunity to relax the mind. I wrote a post last night, it sucked, and I’m not going to publish it — ever. Lol. However, I've read stories of people who write their best stories and poems on their sick beds. Try that. Don't write with the intention of showing someone. That’s not what it’s about, it’s about making the best of what you currently feel. It’s one thing to write 500 deep heartfelt words, it’s another thing to write a 30,000 word book on a single topic. I’m all for heart-body (inside-out) living, so I find it’s crucial to let the stronger one lead the dance. I remind myself that I’m not required to feel sad or miserable just because I’m sick or my body is aching. You can be in pain and not suffer–or at least not add to the external suffering with a “poor me” monologue in your head. The easy way out of the "I feel miserable" feeling to is play some really good happy songs. I created a folder with the title "Happiness" in my music library. I have selected songs that charge my mind and get me into the mood. Music is medicine! Don't brood over your sickness. Call some crazy friends to make you laugh. Watch a comedy show. Just find a way to laugh. If you can, LAUGH BY YOURSELF. I can't remember where I read about a woman who said she healed her breast cancer by watching funny movies. That might sound ridiculous and irresponsible but it is very possible. Laughter does release happy chemicals into our bloodstream, it uplifts our spirits, and it gives us something to look forward to. Think about how you want to live the rest of your life. 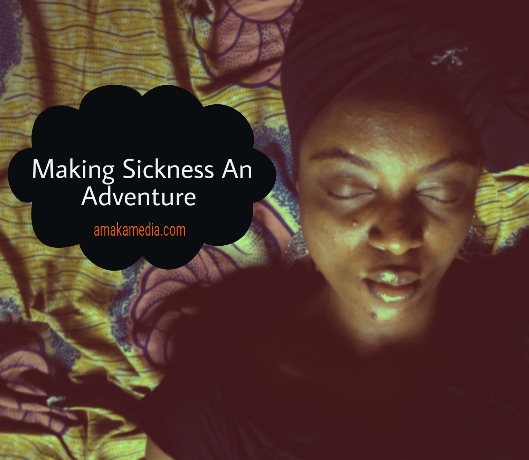 Being sick can be an opportunity to reflect on your life. You now have the freedom for meditation and reflection. The freedom to explore ourselves and explore the world is usually as a result of peace in our heart. It’s the time to decide what you’ll stand for during the next season of your life. You just never know the ideas that might pop out of a sick head. Sickness can be a blessing in disguise. Make it an adventure! Life is a journey full of adventures and every day we come across new events or emotions that we must conquer or experience. P.S I hear there is something my friend can take to stop the pain (menstrual cramps). Lemme know what you know. I don't want her to die. Lol. Menstrual pain can't stop my shine. Here is wishing you the best of the week. Have a blast! Stay inspired. Stay positive. Stay sweet.